If you’ve ever felt energized or tired around the same time each day, you’ve experienced the circadian rhythm at work. What exactly is a circadian rhythm, and why does it matter? Essential though circadian rhythm is to sleep and wake cycles, its importance doesn’t end there. 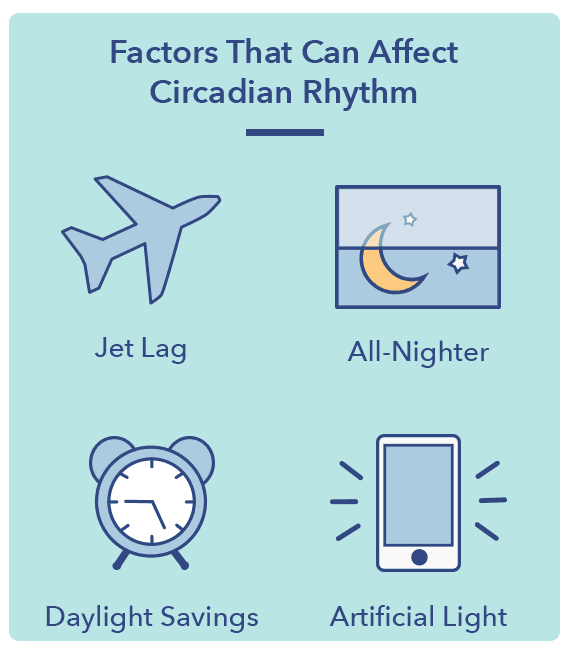 The circadian rhythm interacts with the brain and body to regulate numerous important physiological functions, from blood pressure to core temperature to metabolism. Q: Where does the word circadian come from? A: Coined by a sleep scientist in 1959, circadian is a Latin term that fuses “circa,” which means around, with “diem,” meaning day. 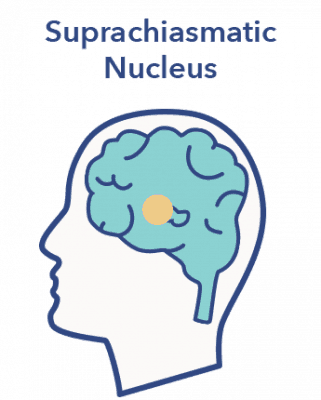 Each of the body’s biological clocks is governed by the “master clock,” a group of approximately 20,000 nerve cells that form the suprachiasmatic nucleus, or SCN. (10) The SCN, located in the hypothalamus in the brain, uses cues such as daylight to signal feelings of alertness and sleepiness. The SCN also contains receptors for melatonin, commonly termed “the sleep hormone.” Neurons in the SCN fire in a 24-hour rhythm, reaching a peak at mid-day. Once the master clock releases signals that trigger certain body functions, the biological clock sets the circadian rhythm in motion. The biological clock produces daily circadian rhythms, monitors their timing, and controls other cycles that occur seasonally and yearly, such as a woman feeling that her “clock is ticking” near the end of her childbearing years. (13) The biological clock controls these cycles while coordinating with the master clock to keep the circadian rhythm in sync with the surrounding environment. The SCN is located in the hypothalamus region of the brain and uses signals from the eyes to produce circadian rhythms. Because circadian rhythm never shuts off, its effects are felt at all hours. Depending on age and lifestyle, natural circadian rhythm may fluctuate. For instance, sleep deprivation can amplify the natural dips and rises of the circadian rhythm, leading to exaggerated feelings of sleepiness and wakefulness. Regular sleep habits are more likely to produce consistent energy levels throughout the day, as well as lower levels of daytime sleepiness. During a typical day, energy begins a slow climb on awakening and continues until early afternoon. Soon after, energy begins to decline, hitting a low around 3:00 pm. After the 3:00 pm lull, energy increases again, peaking around 6 pm. Alertness tends to wane for the rest of the evening and into the early hours of the morning, hitting its lowest point at 3:30 am. 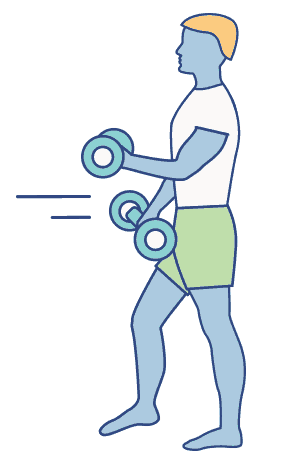 Research reveals that circadian rhythms have an important influence on energy and fitness levels, as well as the functioning of essential bodily processes. A healthy circadian rhythm is linked to longevity, reduced stress levels, and a strong metabolism. Irregular circadian rhythms have been linked to chronic health conditions such as sleep disorders, obesity, and depression. (19) Research reveals that night shift workers have an increased risk of obesity and diabetes, and may be at increased risk for accidents. Blue light emitted by screens on cell phones, computers, tablets, and televisions restrains the production of melatonin and is a major contributor to an irregular rhythm. The circadian cycle is strongly associated with the body’s metabolism. 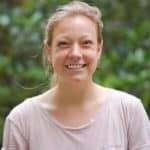 (20) While genetics influence the body’s ability to maintain energy balance through food and drink consumption, studies reveal that both circadian rhythm and environmental cues such as light also play a key role. In the last decade, researchers discovered that circadian rhythms help to regulate energy levels in cells. This may help explain why a disrupted sleep pattern can increase hunger, which could lead to weight gain, obesity, and other metabolic problems. Q: What is the retina? A: A light-sensing membrane at the back of the eyeball that sends signals to the brain, influencing circadian rhythm. Both the biological clock and external cues such as light and darkness are strongly linked to mental health. 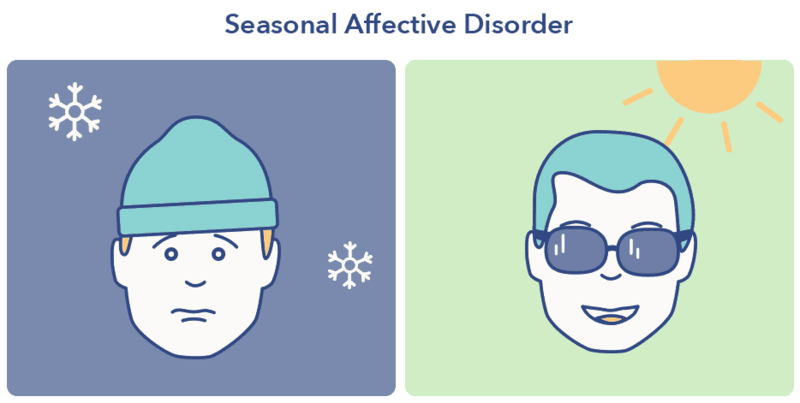 Seasonal Affective Disorder (SAD), a type of depression closely connected to the seasons, may be the best-known example of how circadian rhythm can affect mood. SAD typically begins and ends at the same times of the year, diminishing as daylight hours increase. The process by which the body converts food and drink into energy. 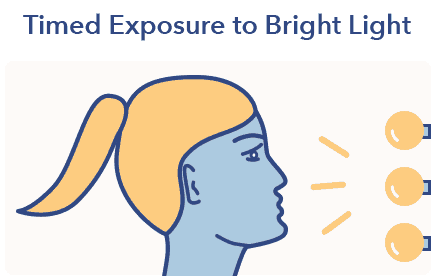 Q: What is bright light therapy? A: A circadian rhythm disorder treatment that mimics natural outdoor light and affects brain chemicals linked to mood and sleep. Circadian rhythm functions best in conjunction with healthy sleep habits, such as going to bed and waking at the same time each day. Irregular sleep and wake times may disrupt the circadian rhythm, leading to health complications. Naps are unlikely to disturb circadian rhythm if scheduled during a low point of alertness, usually around 3:00 pm. Chronic disruption of the circadian rhythm may lead to sleep disorders or other related health issues. While some circadian rhythm disorders are intrinsic, meaning a person’s body clock is off-kilter from the rest of society’s, others are circumstantial, or extrinsic, meaning a person’s circadian rhythm is out of sync with typical light/darkness patterns. (36) This is often due to non-traditional work hours, traveling, or exposure to large amounts of artificial light. This type of disorder occurs when someone feels tired later in the night and goes to sleep at least two hours past a reasonable bedtime, which for adults is often said to be by midnight. However, they still require the recommended 7-9 hours of sleep, but due to work, early school start times, or other life demands, can’t rise later in the morning. Another disorder similar to DPSP is advanced sleep phase syndrome (ASPS), which causes sufferers to feel tired earlier at night and go to bed earlier than is typical. 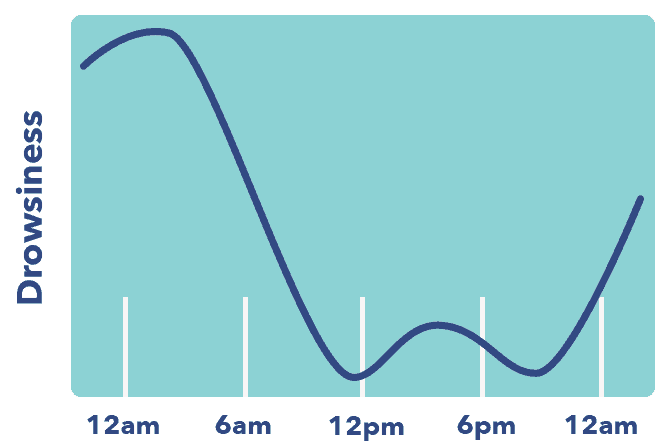 (39) ASPS sufferers tend to feel tired in the late afternoon and go to bed between 6:00 and 9:00 pm. Because bedtime is early, they also wake up early — usually between 2:00 and 5:00 am. Waking at such an early hour may make falling back to sleep difficult, leading to insomnia. A family of sleep disorders affecting the timing of sleep, among other bodily processes. People who suffer from Non-24-Hour Sleep-Wake Syndrome have a circadian rhythm that is out of sync. This results in a sleep cycle that is slightly longer than 24-hours, forcing later daily sleep and wake times. A Non-24 sufferer with a 24.5 hour clock might sleep 30 minutes later on the first day, one hour later the second day, and so on. The sleep-wake cycle will eventually realign with the 24-hour light-dark cycle, providing temporary relief and conventional sleep. The sleep cycle will continue to shift, however, creating repeated cycles of later sleep and wake times. Scientists do not know how many people suffer from this disorder, nor are they entirely sure how it forms. Some researchers believe it develops in people with a weak body clock, which may result from such neurological conditions as dementia and brain damage. “Shift-work” is defined as working hours outside of the traditional 9:00 am to 5:00 pm. time frame, whether the early morning shift, the night shift, or rotating work schedules. 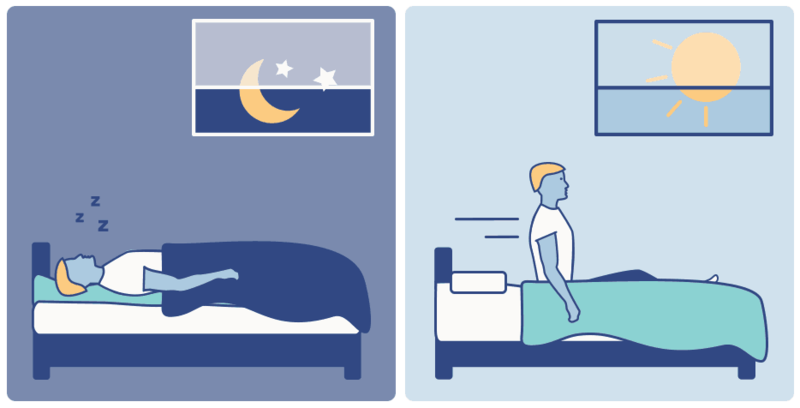 Due to lack of alignment between the sleep/wake and dark/light cycles, SWSD sufferers may have difficulty falling asleep, staying asleep, or sleeping when tired. Q: How many people in the U.S. suffer from insomnia? A: Roughly 60 million Americans are affected by the sleep disorder each year. 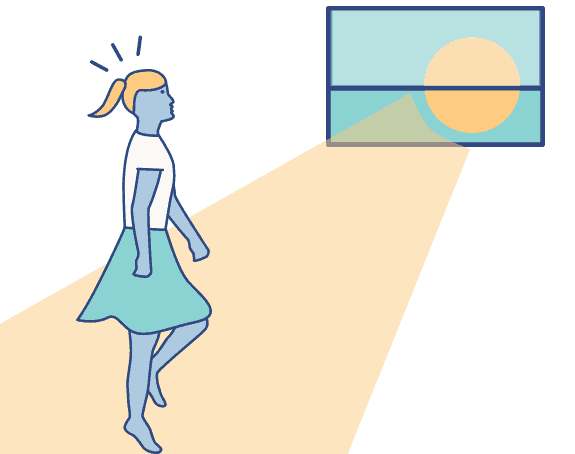 Timed exposure to bright light may help reset the circadian clock in those suffering from severe circadian rhythm disorders. (47) A high-intensity light of approximately 10,000 lux is used in most cases, and exposure lasts from one to two hours. Treatment timing is crucial, and requires assistance from a sleep specialist who administers the light. Sleep in darkness. A pitch-black room is an important signal to the body that it is time for rest. (53) Make sure there are no ways to let light in, whether it’s an open curtain or a blinking light from an electronic. Reduce stress. Stress responses vary throughout the day and can disrupt the circadian clock. Practice meditation, journaling, breathing techniques, or therapy, as ways to reduce stress. Short-wave blue light is light emitted by smartphones, computers, and tablets. It affects the body like sunlight, and may make falling asleep difficult. A healthy circadian rhythm helps promote energy and well-being while lowering the risk of developing certain illnesses. 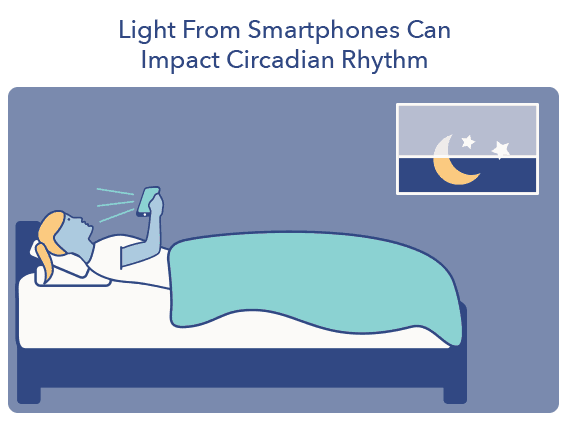 The circadian rhythm works best in conjunction with healthy habits, so make sure to maintain consistent bed and wake times, limit exposure to artificial light from screens at night, and stick to a consistent eating and exercise routine every day. Gu C, Coomans CP, et al. Lack of exercise leads to significant and reversible loss of scale invariance in both aged and young mice. Proceedings of the National Academy of Sciences of the United States of America, Feb 24, 2015.